Evidence that the law causes clinic closures is obvious. JUSTICE KAGAN: And is it right that in the two-week period that the ASC requirement was in effect, that over a dozen facilities shut their doors, and then when that was stayed, when that was lifted, they reopened again immediately; is that right? MS. TOTI: That is correct, Your Honor. JUSTICE KAGAN: It’s almost like the perfect controlled experiment as to the effect of the law, isn’t it? It’s like you put the law into effect, clinics closed. You take the law out of effect, they reopen. MS. TOTI: That’s absolutely correct. Medical procedures (e.g., colonoscopy, liposuction) with significantly higher complication rates than abortion are not required to be done in ASCs. JUSTICE KAGAN: You [Keller] said that as the law is now, under your interpretation of it, Texas is allowed to set much, much higher medical standards, whether it has to do with the personnel or procedures or the facilities themselves, higher medical standards, including much higher medical standards for abortion facilities than for facilities that do any other kind of medical work, even much more risky medical work. And you said that that was your understanding of the law; am I right? MR. KELLER: When there are complications from abortion that’s in the record, Texas can enact laws to promote safety. JUSTICE KAGAN: No, I know, but the assumption of the question, and I think you haven’t challenged this assumption, is that there are many procedures that are much higher risk: colonoscopies, liposuctions, we could go on and on. And ­­you’re saying, that’s OK, we get to set much higher standards for abortion. And I just want to know why that is. Dilation and curettage, which can be used to perform abortions as well as other medical procedures, is exempt from the law, showing that HB2 is about targeting abortion, not protecting women. JUSTICE SOTOMAYOR: ­­What is the risk factor for a D&C [dilation and curettage] related to abortion and a non­abortion D&C? D&Cs are performed in offices for lots of other conditions besides abortion. Is there any evidence in the record that shows that there is any medical difference in the two, in the ­­procedures that would necessitate an abortion being in an ASC or not, or are abortions more risky than the regular D&C? MS. TOTI: No, Your Honor. The evidence in the record shows that the procedures are virtually identical, particularly when D&C is performed to complete a spontaneous miscarriage. So when a woman miscarries and then follows up with her doctor, the doctor will typically perform a D&C. And that’s ­­that’s virtually identical to an abortion, but it’s not subject to the requirements of HB2. JUSTICE SOTOMAYOR: So your point, I’m taking, is that the two main health reasons show that this law was targeted at abortion only? MS. TOTI: That’s absolutely correct. Yes, Your Honor. There is no medical justification for requiring a pregnant woman to actually be inside a surgical theater to take abortion pills. JUSTICE SOTOMAYOR: What’s the percentage of 210 [a number of complications cited earlier] from 70,000? My math is pretty horrible. It’s pretty small. JUSTICE SOTOMAYOR: I don’t mean to negate that one should try to avoid injury to anyone, and don’t take my question as that, but there are people who die from complications from aspirin. May be unusual, but there’s a certain percentage that do that. Yet, we don’t require that people take aspirins in ASC centers or in hospitals. 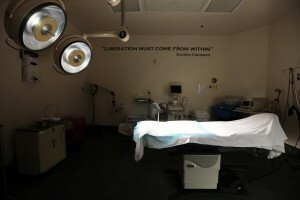 Texas counts a New Mexico facility that does not meet the Texas law’s requirements as an OK place for women of western Texas to go for an abortion. MR. KELLER: Justice Ginsburg … 25 percent of Texas women of reproductive age are not within 100 miles of an ASC. But that would not include … El Paso, where the Santa Teresa, New Mexico facility is. JUSTICE GINSBURG: That’s ­­odd that you point to the New Mexico facility. New Mexico doesn’t have any surgical ­­ASC requirement, and it doesn’t have any admitting requirement. So if your argument is right, then New Mexico is not an available way out for Texas because Texas says to protect our women, we need these things. But send them off to New Mexico where they don’t get it either, no admitting privileges, no ASC. And that’s perfectly all right. Well, if that’s all right for the women in the El Paso area, why isn’t it right for the rest of the women in Texas? Texas attempts to deny well-established risk statistics of childbirth vs. abortion. 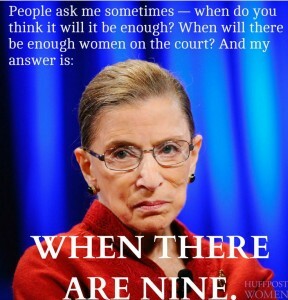 JUSTICE GINSBURG: But what is the legitimate interest in protecting their health? What evidence is there that under the prior law, the prior law was not sufficiently protective of the women’s health? As I understand it, this is one of the lowest risk procedures, and you give a horrible [example] from Pennsylvania, but absolutely nothing from Texas. As far as we know, this is among the most safe … procedures, an early-stage abortion. So what was the problem that the legislature was responding to that it needed to improve the facilities for women’s health? JUSTICE GINSBURG: As compared to childbirth, [a] ­­much riskier procedure, is it not? MR. KELLER: Well, the American Center for Law and Justice and Former Abortion Providers’ amicus brief dispute that. But regardless, there is evidence. JUSTICE GINSBURG: Is there really any dispute that childbirth­­ is a much riskier procedure than an early-stage abortion? Using the Pennsylvania scandal of convicted murderer Dr. Gosnell to justify the Texas law has no logical basis. JUSTICE GINSBURG: … [T]he problem in Pennsylvania was this filthy clinic hadn’t been looked at by anyone from the state in 16 years. But Texas can go into any one of these clinics and immediately spots a violation? It says you can’t operate till you come up to speed. So Texas has had, as Justice Kagan pointed out, its own mechanism for preventing that kind of thing from happening. JUSTICE SOTOMAYOR: It’s valid only if it’s taking care of a real problem. MR. KELLER: And there were the ­­abortion complications and underreported questions. JUSTICE SOTOMAYOR: Well, no, no, no. A real problem, meaning, Gosnell, the governor of Pennsylvania said, was a regulatory failure. And only in that, not this clinic had not been inspected for 15 years. He, the doctor, was fabricating his reports. That could happen almost in any setting. Anyone who intends to break the law is going to break the law, whatever the regulatory rules are. You’re going to have doctors, as happened pre our laws, who were performing abortions without permission in their offices or without licenses. And I don’t want to suggest that we should presume that’s going to happen, but it will happen. MR. KELLER: The constitutional standard for whether a state can make abortion safer can’t be that it can only prevent the Gosnell situation, and there are complications. 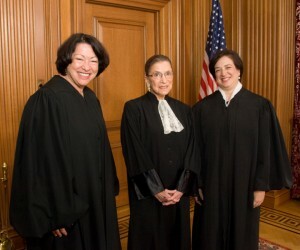 JUSTICE SOTOMAYOR: Well, but yeah, but ­­you have to see, as Justice Breyer asked you earlier, why are [there] problems? Isn’t this a self­-created problem? What happened in Texas independent of Gosnell that raised the Gosnell-like situation concerned in Texas that made the legislature after so many years about taking care of this greater risk in abortions, as opposed to all the other procedures that are performed in non­-ASC facilities? JUSTICE SOTOMAYOR: Twenty-eight. Justice Breyer just corrected me. MR. KELLER: But legislatures react to topics that are of public concern. My take on the day’s jousting? The women justices clearly signaled that they think there is plenty of evidence to decide the case. Questions from most of the men, except Justice Breyer, however, seemed to signal that they were looking for a way to punt and delay a precedent-setting decision. Who knows what will happen? We will — no later than June, best guess. This entry was posted in Abortion, Legislative Watch and tagged abortion, anti-choice, Cecile Richards, D&C, dilation and curettage, Elena Kagan, family planning, HB 2, HB2, health care, Justice Alito, Justice Breyer, Justice Ginsburg, Justice Kagan, Justice Kennedy, Justice Sotomayor, Kermit Gosnell, legislature, New Mexico, PBS NewsHour, Planned Parenthood, pregnancy, reproductive rights, Ruth Bader Ginsburg, Samuel Alito, Scott Keller, Sonia Sotomayor, Stephanie Toti, Supreme Court, Texas, TRAP laws, undue burden, Whole Woman's Health v. Cole, Whole Woman's Health v. Hellerstedt, women, women's health by Anne Hopkins. Bookmark the permalink.